I used a 12 weeks long marathon training plan from Pfitzinger to prepare for this race — named Pfitz 12/55. I chose this one, because I had great success with a half-marathon plan from the same coach back in February at the Cambridge Half-Marathon — 1:27:26 hours. Although the half-marathon and the marathon plans are very similar, my training was completely different. For the half-marathon I trained during winter and there is not much to do during the cold, windy, rainy British winter, so I could focus on the training. After taking a month off in March from heavy training I started my marathon preparation in April. As spring and the good weather arrived it was much harder to focus on the runs and I had to rearrange my weekly schedule several times. Also this is a very busy period, there are a lot of races — and of course I wanted to participate at them. The problem with racing is that you need some recovery time after them, but with such a short preparation for the marathon it is almost impossible to do this properly. Mid-April I run the Budapest Vivicittá Half-Marathon — 1:35:55 in very hot and windy conditions. May was a much busier month, with the Wings for Life World Run where I run 33.16 kilometers, followed by the Waterbeach 10K where I finished in third place and then the London 10,000 where I run an unofficial personal best. All of these races were successful, I am happy and satisfied with my results. The only problem is that all of them required a week of recovery, so totally I have lost four weeks when I could not do any hard training. Beside this the last two weeks were tapering, so totally I was left with six out of twelve weeks to do some quality training for the marathon. I felt good all year long, I had no injuries, therefore I was able to train and to race at maximum — so different from last year, when I fractured my ribs twice and had to skip several races because of these injuries. 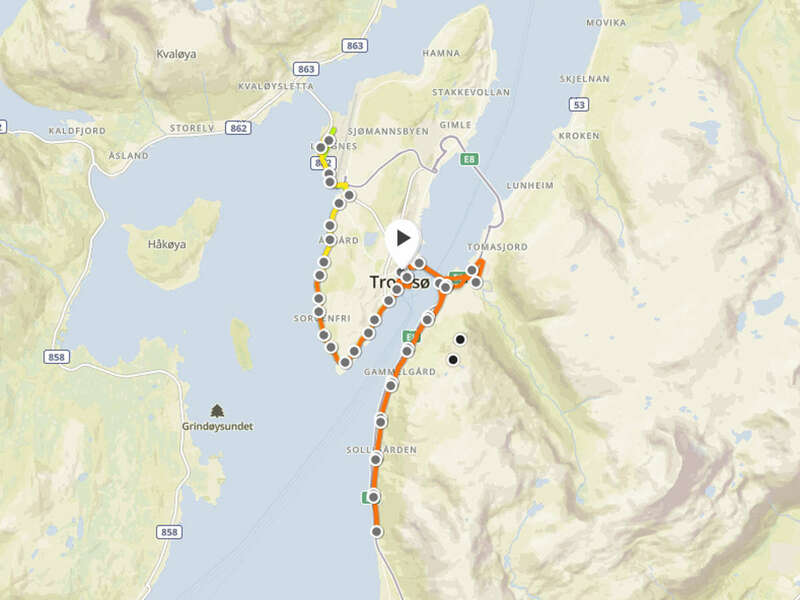 Tromso is far away, above the arctic circle and it is not easily accessible. 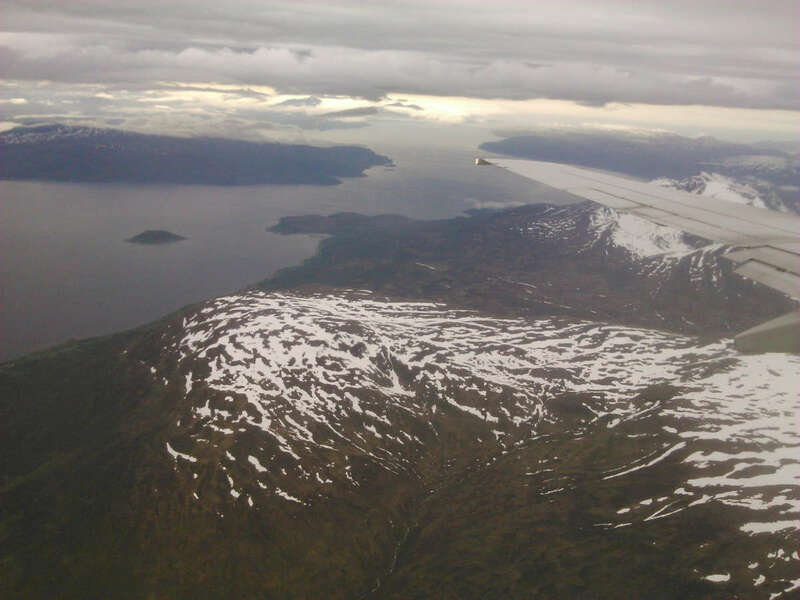 I traveled from Cambridge, flying from Heathrow to Oslo and from there to Tromso. I have left the house at 4 in the morning and arrived around 5 in the afternoon to the hotel in Tromso — a bit more than 24 hours before the start. A long and exhausting trip. There was a pasta party on Friday evening, but I did not participate at it. I preferred sleeping after my journey — and also my body is intolerant to wheat, so eating pasta is not a good idea for me. The race starts on Saturday evening and that makes things complicated. Most marathons start in the morning, so people are used to it — you sleep during the night, wake up early, eat a bite or two, head to the start area, warm up and run. With the start in the evening this process doesn’t work. In the morning I went for a short walk in the city center do get a feeling of the town and to collect my start number. Although it was a cold, rainy day a lot of people were outside as there were some events in the town. I saw a boat race in the harbor before reaching the Storgata pedestrian street — the organizers were working hard here to assemble the finish area. The start area was only a few meters from there, on the Gronnegata street, next to the town hall. I have picked up my start number with an integrated timing chip on its back in the town hall. Also I have received a few magazines, the race booklet and a plastic sports bottle. There was chip control, too. To avoid the cold rain and to rest I went back to the hotel for a few hours before I returned to the city center. This time I went there to see the king and queen of Norway as they have visited Tromso. Sadly because of the crowd I could not see them and they stayed there only a minute or two. This was followed by the kids’ running race. There were hundreds of kids, but only fifty or so started to run at once. I did not really understand what is going on. There was a huge crowd and people were pushing me around or stepping on my feet. It started to rain and the announcer was speaking only in Norwegian, so I could understand him either. I went back to the hotel for a bit more rest before returning to the start of the marathon in the evening. The start was on the Gronnegata street in the city center. I have arrived there about half an hour before the start at 20:30, but the area was almost empty. Most of the runners were hiding from the cold and shower in the town hall. I joined those few who were running to warm up for the race. I felt strong, ready to race. Slowly we lined up at the start line. The announcer was mostly speaking in Norwegian, so almost nobody payed attention to him as we had no idea what he was saying. There was a short warm up with the help of a fitness club. The rain stopped and the weather was perfect for running — dry, cloudy with a little breeze. After the countdown — in Norwegian too — we were off! The first two kilometer of the race was quite complicated. The streets in the city center are narrow and we had to take a lot of turns. The runners were running very fast, most of them faster than they should. I tried to keep a steady pace and stick to my plan to avoid running too fast in the first part of the race. I found it hard to run in the crowd and at the same time trying to figure out where the route goes. We reached the harbor, run on sidewalks, passed under the bridge before we made a turn and started running towards the bridge. 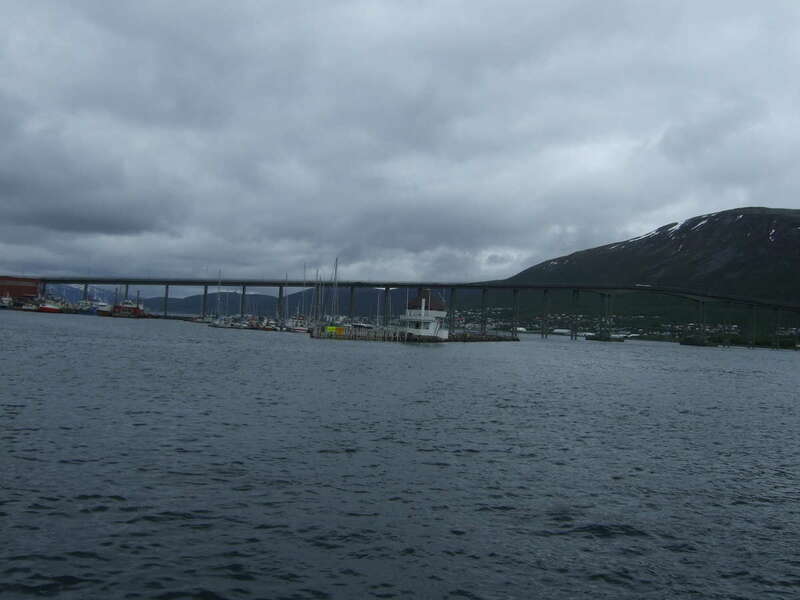 The bridge connects the Tromsoya island — this is where the city center is — with the inland. It is about one kilometers long and very steep. At this point running became much relaxed, finally the runners slowed down and everybody tried to keep a steady pace. Running uphill was exhausting, and the strong wind from the side was very annoying. Luckily there were people on the side of the road cheering for us. 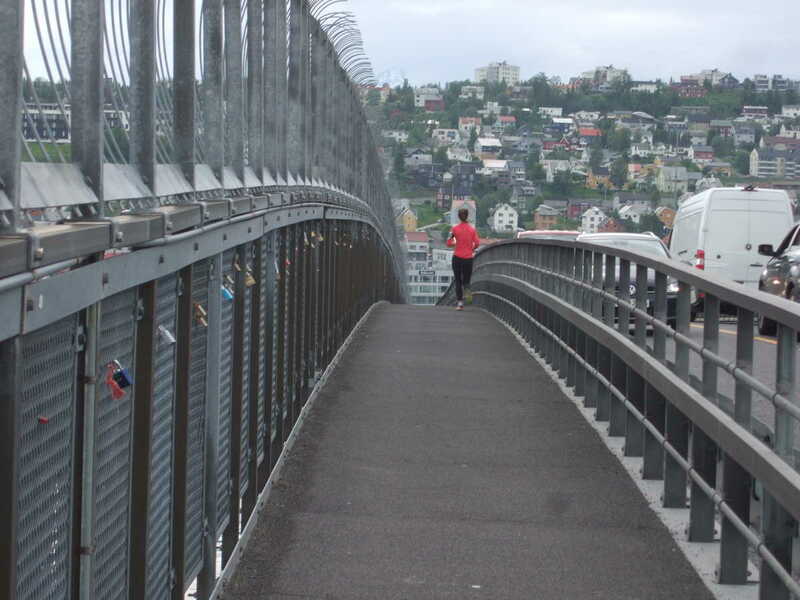 After reaching the top of the bridge it felt good running downhill for a few hundred meters before we reached the shore below the Storsteinen mountain. Only three kilometers completed so far. 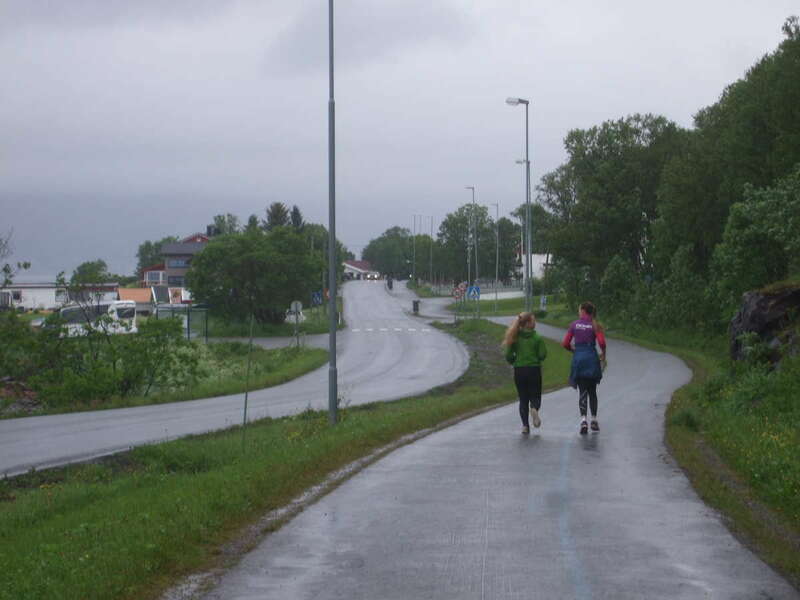 Here we had to run on the cycleway for about a kilometer, while cars were passing by on the road, something that I found very annoying. I just could not believe that they could not close the roads for traffic in the middle of the night during the weekend at one of the most famous races of the world. Cycleways are dangerous. They are not wide enough for a thousand runners. There are barriers, lampposts, holes, steps, etc. You can easily injure yourself if you don’t pay attention even for a moment. Finally we were allowed to leave the cycleway and we could run on the road. This was my favorite part of the race. Running was easy on the road, I could get into a steady rhythm. I have joined a little group of seven or eight and we helped each other. 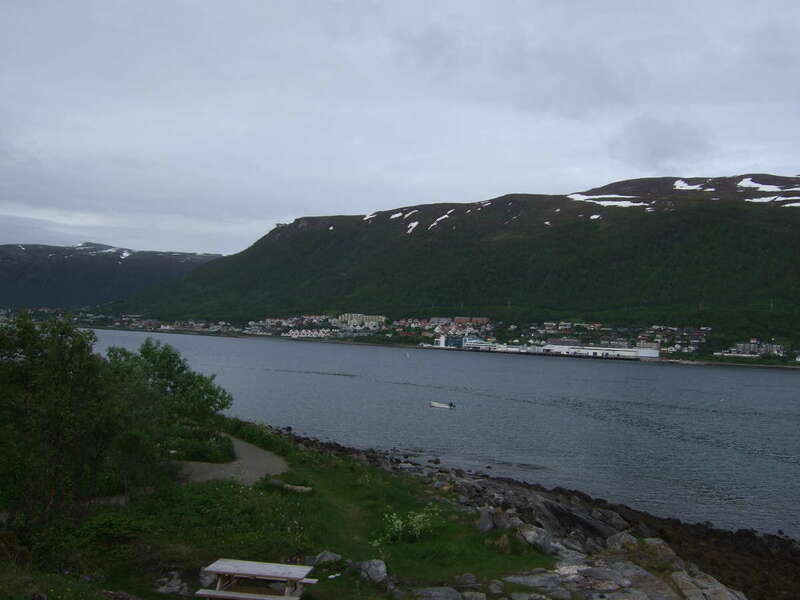 We were running through some kind of village or an outskirt of Tromso. There were nice houses on both sides of the road and a lot of people were cheering for us. The view was nice, on our left side was the mountain, covered with trees and bushes. 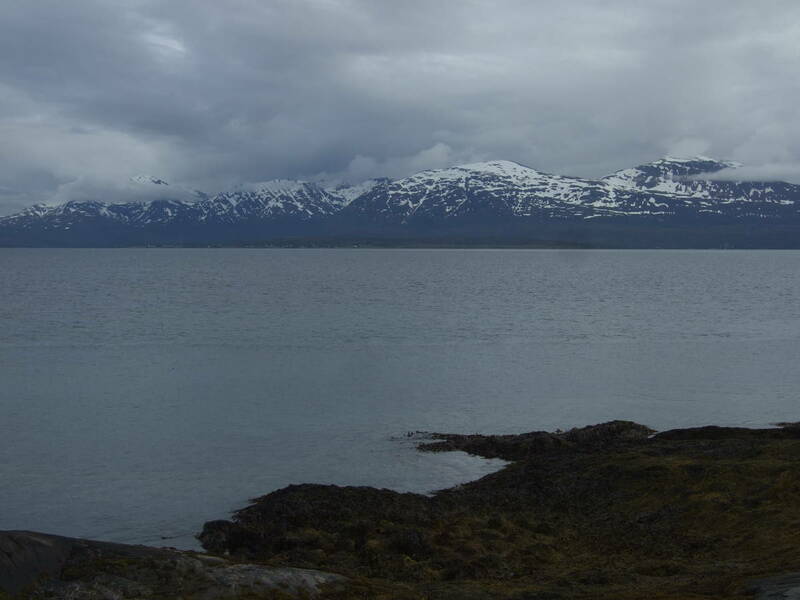 On our right side was the fjord, then the Tromsoya island on the other side of the fjord and the mountains with their snowy tops in the background. There were groups of kids standing on the side of the road, they made a lot of noise and while we passed by them we gave high-fives. It feels very good when you are supported during a race and running was almost effortless. Sadly as we reached the turning point at the tenth kilometer mark everything has changed and running became challenging. After the turning point we had to run back to the bridge on the other side of the same road. It started to rain and the wind started to blow even harder — against us. My hands instantly felt cold, I had to put on my gloves. My clothes and shoes get wet in a few minutes. Running in these conditions was quite hard. People who were supporting us disappeared one by one. Our little group fall apart during the following few kilometers. The view was not as enjoyable as before because the wind blew the rain into our eyes whenever we look up. At about the fifteenth kilometer mark we had to return to the cycleway. A big disappointment for me, but to make things easier I have joined two other runners. This was a good idea as we started our long and complicated ascent to reach the bridge that connects Tromso with the inland. We had to run at least three kilometers on narrow, windy sidewalks, mostly uphill. I read some reviews about the race and some people mentioned they got lost during the race — this was shocking to me, it rarely happens during a road race. Running this part of the race I understood what they were talking about. Without the help of the two other runners I would not have found the route. I guess they have already run this marathon as they were familiar with this area, so I just followed them. 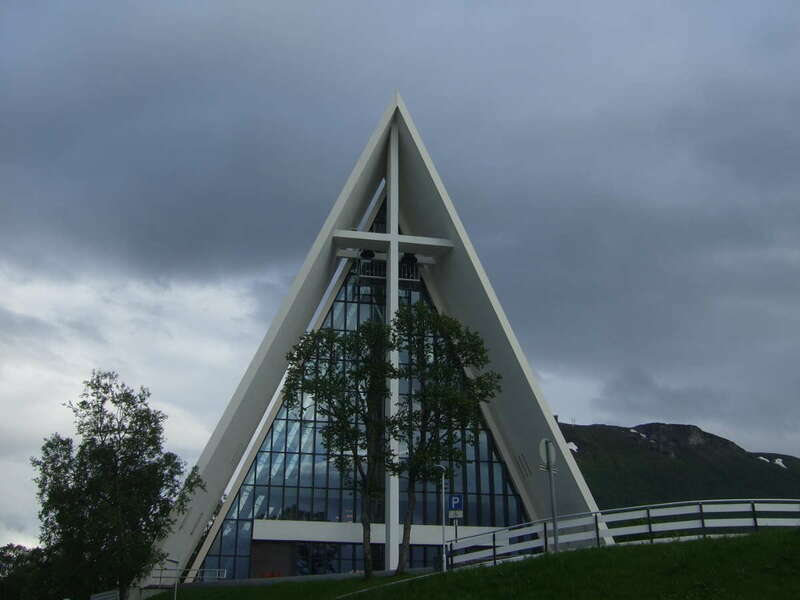 Finally we reached the Arctic Cathedral, the most famous building in Tromso, and started our ascent on the bridge. This time we had to run on the sidewalk, we were not allowed to run on the street. The sidewalk was about one meter wide, with a tall, strong metal fence on both sides. Most of the runners were pushing hard to reach the top of the bridge as soon as possible, while I slowed down and tried to save energy for the second half of the race. The view is amazing from the top of the bridge, even when it is cloudy. 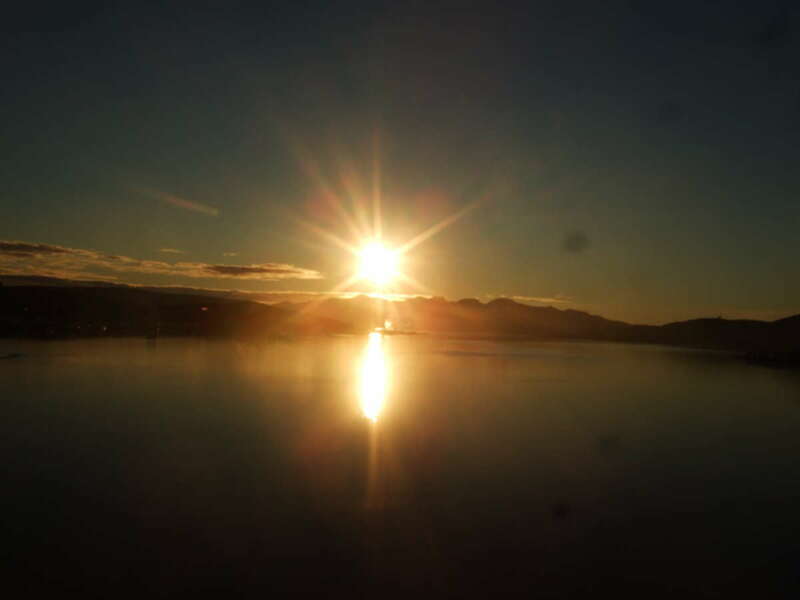 During the race we had to dream about the midnight sun — I saw a few days after the race. And the fjord when the sun is shining looks simply gorgeous! The downhill part of the bridge was easy and I overtook several runners before we reached the island and the halfway point. I have completed the first half of the race in about 1:34 hours. I felt good and full of energy, but my clothes and shoes were wet and I started to feel a bit cold. It was around 10 o’clock in the evening and because of the heavy clouds it was a bit dark. It felt like at dusk. You are waiting that it will get darker and darker, but it never happens. 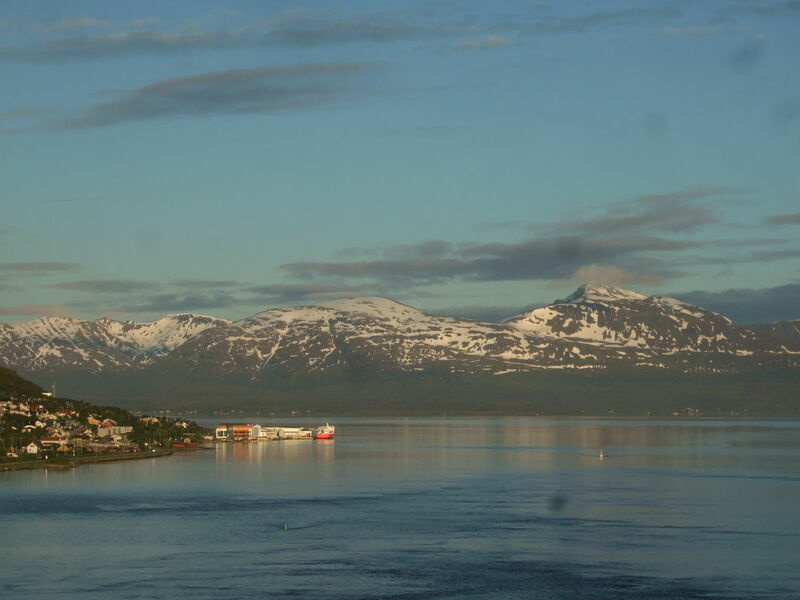 It is a very strange feeling — this was the first time I have experienced the summer days above the arctic circle. The second half of the race was hard and challenging. We followed the route under the bridge and along the harbor to reach the city center. Because of the low light conditions and the tricky route I was happy I can run together with those two runners I have mentioned above. Thank you guys for your help — even that you had no idea during the race you are helping me! After running through the city center and passing a lot of famous hotels, a church and the Polaria, we ran straight forward towards the southwestern tip of the island. 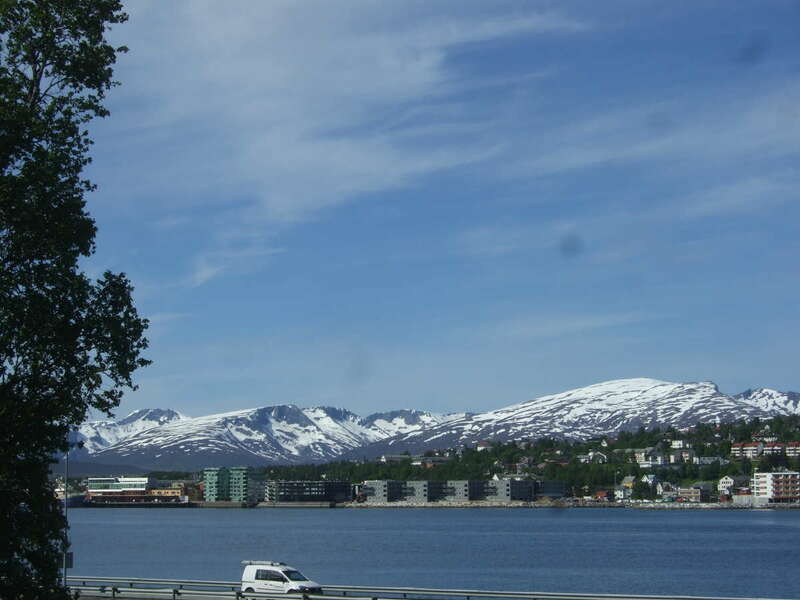 The view was nice, on our left was the fjord and at the other shore of the fjord was the Storsteinen mountain. We reached the corner of the island after 25 kilometers of running and took a sharp right turn to head north, following the coast, towards the airport. We had to run on the cycleway, again. This was the point where things turned bad for me. The weather was awful, it started to rain again and there was a strong, chilly wind against us. I slowed down instantly. I started to feel colder and colder, my wet clothes could not protect me anymore. I tried to fight the wind for the next few kilometers, but running started to hurt. My muscles could not move properly. My toes started to hurt in my soaking wet shoes. Whenever my feet touched the ground I felt a strong pain in the sole of my feet. My ankles and knees didn’t bend. This was not the first time I had problems during a marathon — once I eat to much and had stomach problems, once I eat to little and run out of energy, once or twice the summer heat knocked me out, once I injured my knee, once I run a marathon with a broken rib, etc. I know how pain feels during a race, as most of my marathons were challenging. Feeling cold was a complete new type of experience and pain. 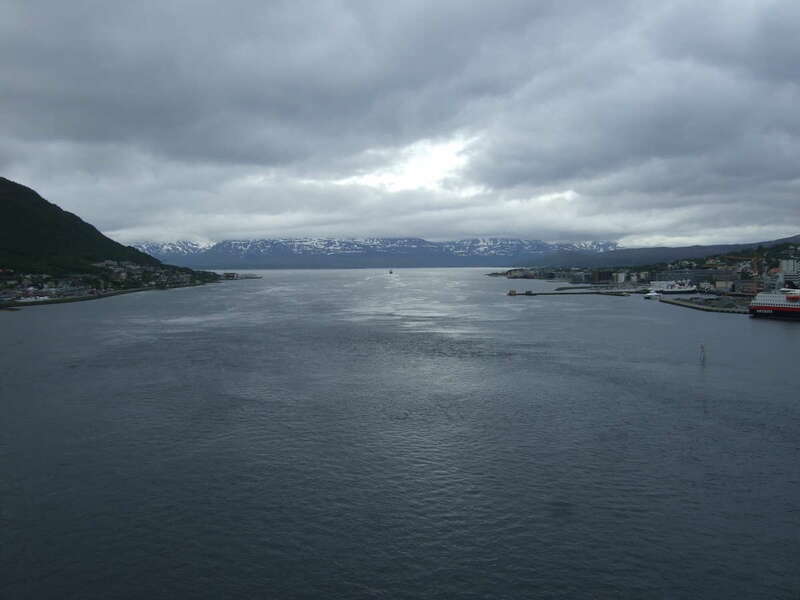 I was expecting nice views, beautiful midnight sun and an easy race. Instead of that I had some serious pains — at some points my mind tried everything to stop me, e.g. it explained to me that I will lose a few toes. Not just physically, but psychologically too it was a huge challenge to run the Midnight Sun Marathon. I was prepared mentally, so I kept going. The cycleway went straight forward for about 5 kilometers and it was easy to run on it, except when we had to cross a few streets. At the 30th kilometer we had to turn left at a roundabout — I almost went straight forward, luckily a volunteer shouted after me. Although the airport was very close from this point, it felt an eternity to reach it. I had to walk when the pain was too strong. I wasn’t the only one struggling, a lot of runners around me were walking. My last hope was the turning point at the airport, from there on I didn’t have to run against the wind. I mixed running with walking, but I tried to run as much as possible. The problem was that my legs didn’t move the way I wanted to, my muscles felt numb and they couldn’t do their job. Finally we reached the turning point after 32 kilometers and continued our run back to the city center where the finish line was waiting for us. Running the last ten kilometers of the race was the hardest. I was shivering, my legs felt numb, my feet and toes hurt… but the views were beautiful! I felt much warmer during my walking periods than while I was running, which is weird and I don’t really understand why. We were still running on the cycleway, but on the other side of the road, next to the water. By this time the half-marathon runners catch us — they started two hours after the marathon and run the city center-airport part of the marathon route. I didn’t care anymore what my finish time will be. I enjoyed the views as much as possible and ate a lot from the food served at the refreshment points. There was water, sports drinks — incorrectly called energy drinks by the volunteers —and bananas at every few kilometers. There were a few supporters here. One of them even offered me a jacket, but I had to refuse it as I won’t leave a woman in the rain without her jacket. It was a very nice gesture, something that really touched me — and this wasn’t the only time during my trip to Tromso when a Norwegian person offered me, a stranger, his/her help without asking for it. So different from English people, who are polite, but distant. I was dreaming about a hot shower, this kept me going. Around the 35th kilometer the cycleway ended and we were allowed to run on the road. This is one of my favorite parts of Tromso, the views are amazing and only a few houses are in this area, so it is very quiet and relaxing. I had to return here several times during the week after the race. After covering 37 kilometers I had to take a longer walking break of about half kilometer to warm up a bit and prepare for the last 4-5 kilometers of the race. On my right was the fjord and the beautiful mountains. On my left were the runners going towards the airport. Around me were half-marathon and marathon runners, but it was impossible to tell the difference. Shortly after this we turned left close to the tip of the island. After climbing two smaller hills we were back to the city center. The roads were packed with people, all of them shouting or clapping. I absolutely enjoyed the atmosphere, i waved at them and thanked their cheering. It was beautiful! Finally I have crossed the finish line, completing one of the most beautiful and unique marathon races of the world. It was my tenth marathon. Also it was the first time I ran during the night — I am visually impaired as I have night blindness, therefore I always run during the day in good light conditions. We received our finishers’ medal and a thin blanket to keep us warm. There was water and banana served. All the runners were in a hurry, including myself. Contrary to other races, everybody wanted to go home as soon as possible. I have spent about a quarter of an hour at the finish area before heading back to the hotel. I wasn’t particularly tired, but I was fed up with the cold. It was around 1 o’clock at night, but there was still daylight. Strange, confusing, safe and comfortable. Arriving back to the hotel I have realized the floor heating is the best thing in the world. I got rid of my wet shoes and socks and just stood there, in the middle of the room for a long period. The warmth coming from the floor was amazing and finally the pain started to disappear from my feet. A hot shower warmed me up, and I was hoping I didn’t catch a cold. 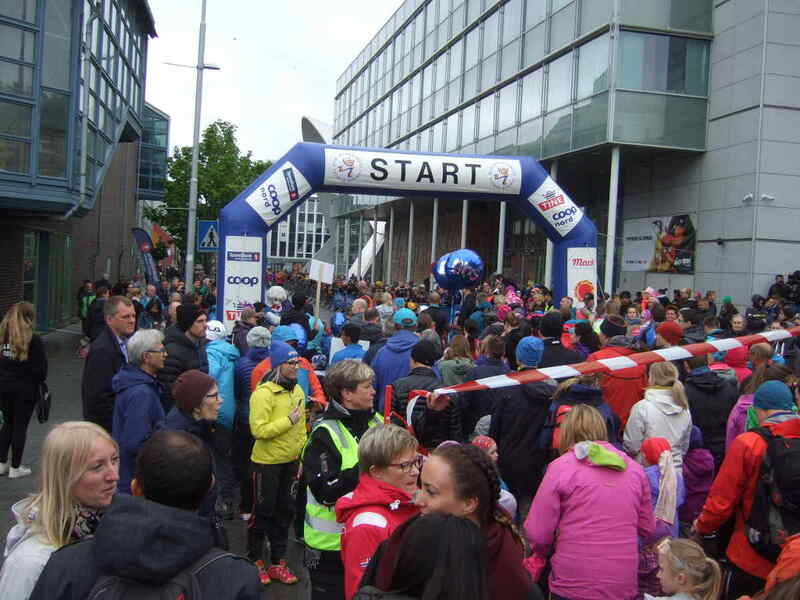 Based on the official result, 775 runners completed the race and about 25 dropped out. More than a hundred signed up, but didn’t show up in the end. My official finish time was 3:56:15 hours, enough for the 317th position — this was one of my slowest marathon. The data measured by my running watch can be found on Strava. The winner, a Kenyan runner, completed the race in 2:31:53 hours, which is a very slow time at professional level, but given the circumstances a good one. This is a very unique race and recommended for all marathon runners to run here at least once in a lifetime. Running during night in daylight is something that is almost impossible to explain, you have to experience it. 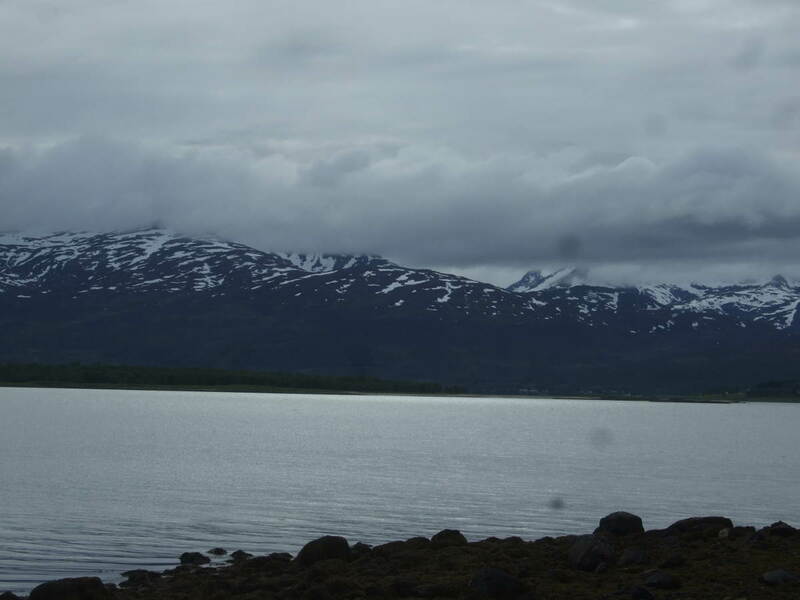 The views are beautiful, even when the weather is terrible — if you are lucky the midnight sun will show and then your jaw will drop. The organization was very good, but with more problems than I expected from such a famous race. The most annoying is the route, we had to run about half the race on cycleways and sidewalks. Also the website is very basic compared to other races’ websites and the route map and description provided is not very detailed. I don’t get why the kilometer markers were in reverse order, counting down from 42, it was confusing and unusual. Official photographs of the race were made by a third party company and they sell them at a very high price — that’s why you don’t see here any photos made during the race. I enjoyed that everybody could speak English, it made communication very easy. It was good that no T-shirt was included with the race, therefore keeping the sign-up costs down. I personally don’t like them and always give them to charities or family members. If you want one, you can buy it. We received very little stuff that other races call goodie bags, but usually it is advertisement that ends up in the trash. Overall the organizers did a very good job! 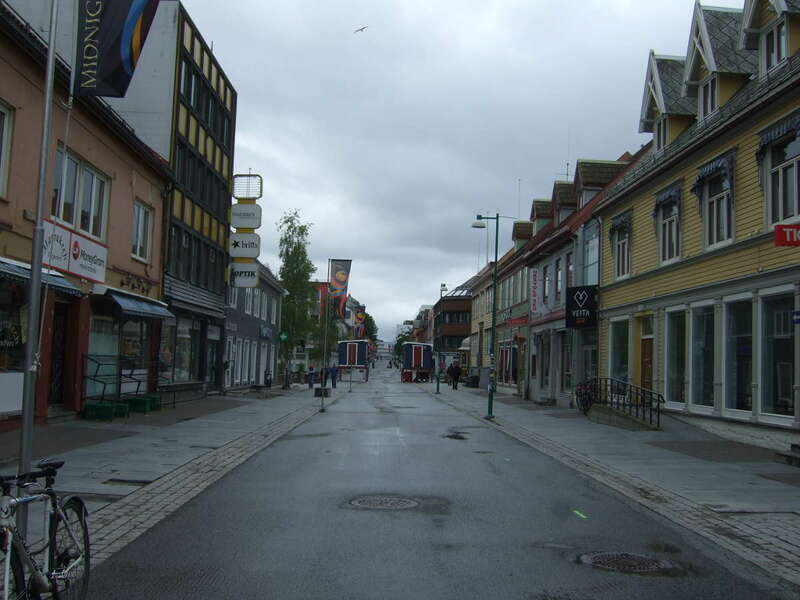 Although Tromso is a small town, there were a lot of people watching us. They stood by the side of the road for hours in the rain just to support us, so thank you very much! And also thank you for the thin blanket at the finish line, it probably saved my from catching a cold. My only real complain is the weather, I didn’t expect such cold, wet and challenging conditions in the middle of the summer. 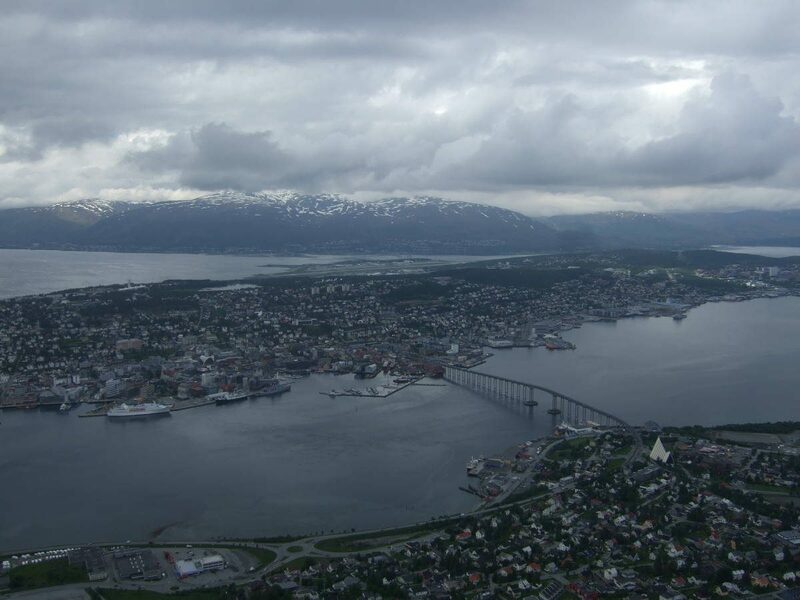 As Tromso is very close to the sea the weather is unpredictable. 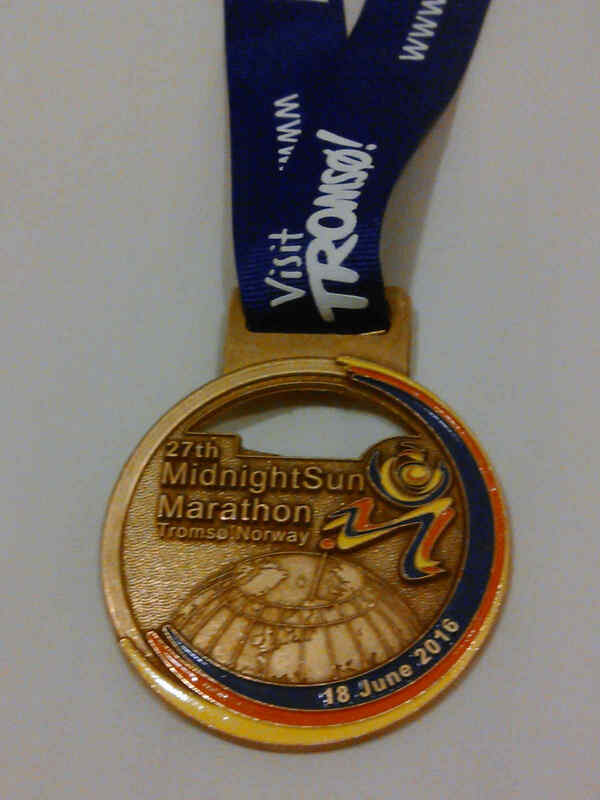 Hope it will be better in the future and runners can truly enjoy the midnight sun!